The second preview performance of Satchmo at the Waldorf went over just as well as the first one. 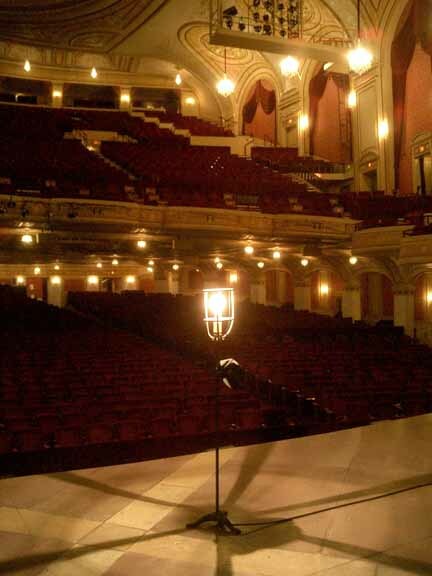 We had an older, quieter audience on Thursday, but they were no less attentive to the show–I didn’t see or hear a single yawn anywhere in the house–and I’m pleased to report that we got our second standing ovation in a row. The official press opening is tonight. We’re very, very hopeful. No matter what happens, though, I plan to sleep in tomorrow. It isn’t quite right to say that I’m burned out, but I am feeling a bit crispy around the edges! As always, watch this space for details. Opening nights notwithstanding, life goes on, and so does my day job. 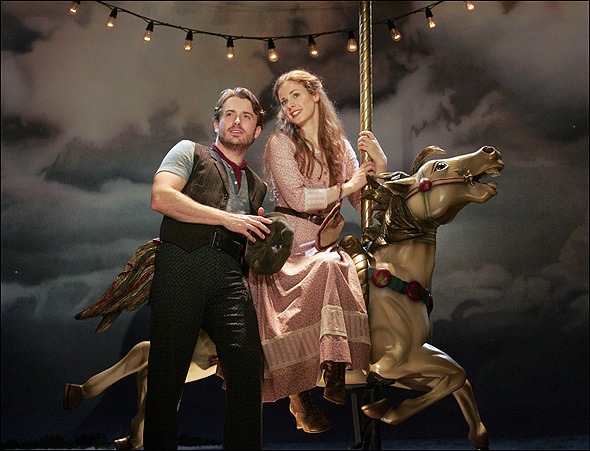 In today’s Wall Street Journal I review Goodspeed Musicals’ outstanding revival of Carousel. Here’s an excerpt. Fifty years ago, Richard Rodgers and Oscar Hammerstein II owned Broadway. Today their heartwarming musicals are viewed askance by younger theatergoers suckled on the sour irony of postmodern pop culture. To do a show like “The Sound of Music” without winking at the audience is to court catcalls. Yet it’s impossible to perform a Rodgers-and-Hammerstein musical effectively without taking its uncynical romanticism seriously. If you don’t believe in your secret heart that love conquers all, you’d better stick to Stephen Sondheim. Is it possible to update Rodgers and Hammerstein by viewing their shows through the prism of contemporary attitudes? Nicholas Hytner tried to do something like that in his famously “dark” Royal National Theatre production of “Carousel,” which transferred to Lincoln Center Theater with great success in 1994. More recently, Charles Newell of Chicago’s Court Theatre directed a radically desentimentalized “Carousel” that revitalized the show by presenting it on a near-empty stage à la “Our Town.” The result was the most effective Rodgers and Hammerstein revival that I’ve ever seen, a production that changed my view of a show about which I’d long had mixed feelings. Now Rob Ruggiero, one of America’s most accomplished musical-comedy directors, has mounted “Carousel” on the tiny stage of Goodspeed Musicals’ 398-seat riverside auditorium, and though his production is not so adventurous as Mr. Newell’s stripped-down version, it is identically effective–and immaculately cast…. Mr. Ruggiero first got on my scope with his masterly 2007 Goodspeed revival of “1776.” Since then he’s directed comparably persuasive Goodspeed productions of “Annie Get Your Gun,” “Camelot” and “Show Boat,” the last of which succeeded in solving the nagging problem of how to present the grandest of all Broadway musicals on a small scale without making it look cheap and cramped. Mr. Ruggiero and Michael Schweikardt, who designed the sets for “Show Boat,” have joined forces again for “Carousel,” and once more they’ve brought off a miracle of creative compression. Is it possible to make an audience see a carousel without actually putting one on stage? It is at Goodspeed. You can’t make “Carousel” work without a knockout Billy Bigelow, and Mr. Ruggiero has turned the trick with Mr. Snyder, who starred on Broadway in the ill-fated “Cry-Baby.” As good as he was in “Cry-Baby,” Mr. Snyder is, if possible, even better in “Carousel.” Not only does he have a powerfully charismatic stage presence–he’ll put you in mind of Mark Ruffalo–but his voice is all but operatic in size….